I am wrong a lot, but wow, did I get my sell at $560 wrong on Bitcoins last week. I apologize for calling the lunatics, lunatics. In fairness to the bulls, a logarithmic chart tells a less bubblicious story. I might have been well served to have used this chart which shows much less price extension, my main reason for selling. 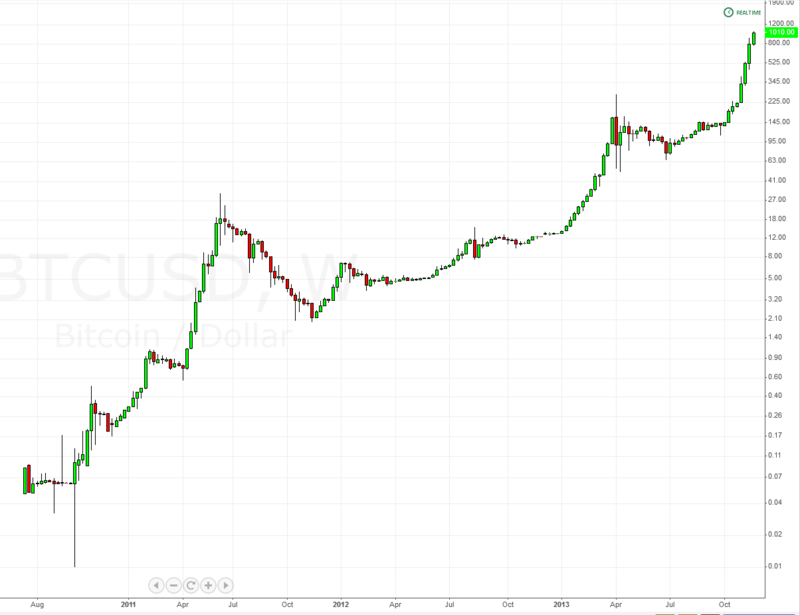 Bitcoins have digested the hyperbolic moves in the past. The markets have always been opportunity machines, but once again in 2013 we are witnessing the mobile, social web bringing life changing, non correlated wealth changing platforms and products to the masses in rapid succession. I apologize to the people that sold on my opinion last week. I owe you a few winners. Should Amazon buy Domino’s Pizza? are you gonna add a bitcoin ticker to stocktwits? Bitcoin is really useful is so many ways and the technology is just getting started. But the asset is just perfect for speculation. It’s designed to have 0 inflation, which means it has basically infinite deflation. It trades 24/7. And there is no real way to value a Bitcoin. So unlike cerca-2000 internet stocks, where you can say “hey this company isn’t actually making any money”, with Bitcoin there is no “main street” valuation to add any sense into the price levels. FWIW, my favorite valuation method is to compare the total amount of transaction activity to the GDP of US states or small countries. So if people do as much commerce using Bitcoins as is done in the state of Pennsylvania in USD, that would be about $400B per year or a $400B “market cap” for Bitcoin, which is about $20,000 per coin. Of course that makes hardly any sense, especially when a lot of the Bitcoin transaction volume is investing and moving money around in accounts. But that’s kind of the point. We have no f’ing clue how to figure out what the value of a Bitcoin is. The 1% is sitting on a lot of money and as they put some of that into Bitcoins, the price is going to go up. It has some room to run IMO. As more companies, investors, and people in general get skin in the game, there will be a limit to how far prices can crash. Lots of people have a stake in making sure Bitcoin doesn’t become “worthless”. Of course some more experienced investors who were paying close attention to other “bubbles” in the past probably recognize this as a case where smart/wealthy speculators are taking advantage of other dumb/wealthy and not-so-wealthy speculators. So the speculation that is a large part of the current price level is going to stick around. I find it hard to believe that with increased use and spending of Bitcoins (public ATMs, everyone with a Bitcoin debit card, Bitcoin transactions baked into internet ecommerce) that the speculation will die down. We have a few more waves left in this IMO. That log chart is probably a good way to try to time it, but be careful. So are you going to buy back in @ ~$1K? no…i am done for a while, just noting my mistake on timing. its still a hugely risky hold up here. its performing like nothing i have seen before. haha, well it potentially solves a problem / creates a solution that the world hasn’t seen before! This apparently does not apply to Bitcoin yet, but maybe the solution to selling too soon is replacing existing equity with slightly out-of-the money options – one delta for each 100 shares. This would serve the purpose of locking in some profit, limiting risk and participating in a potential higher move. 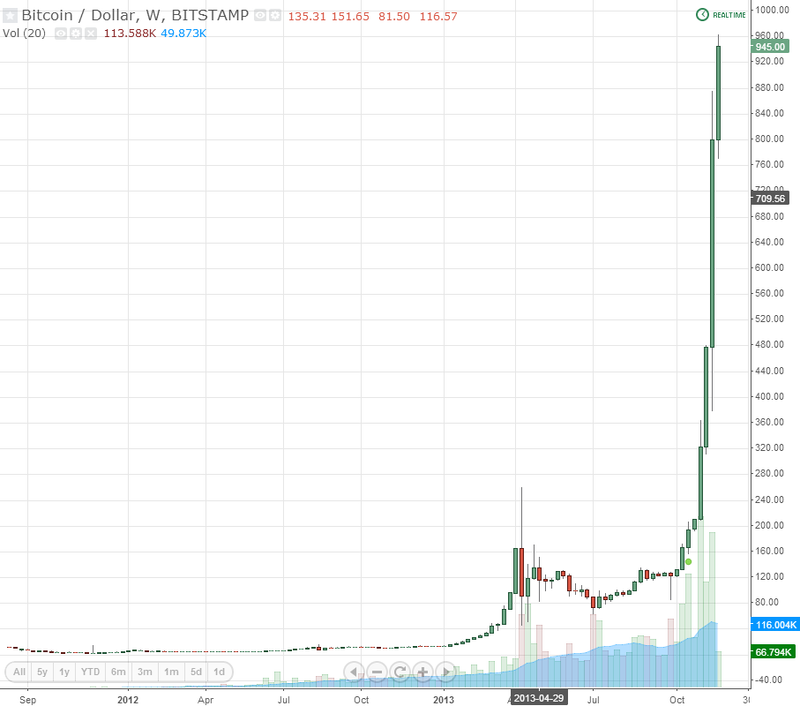 What do you think about what’s going on with Bitcoin now? I was tweeting weeks ago about how it was a bad move to buy. It had all the characteristics of a bubble. I think we’re seeing the beginning of the end here.